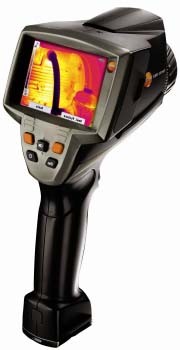 The thermal imager Testo 882 in ergonomic pistol design, with 320 x 240 pixels, stands out thanks to even more precise infrared images. With 76,800 temperature measuring points, it sees every detail on the measured object. This makes it even easier for you to detect anomalies and weaknesses from greater distances. For you, that means: You see more and have more security when thermographing!